You must be a member of the Bogotá Book and Writing Group to attend this activity. Would you like to join this group? Let’s restart our reading club encounters with a novel by Juan Gabriel Vásquez, one of the most important contemporary Colombian writers and one of the most acclaimed writers of his generation, praised by the likes of Mario Vargas Llosa, Jonathan Franzen and E.L. Doctorow, among many others. 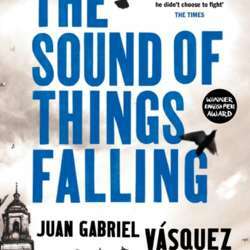 ‘The Sound of Things Falling’ (‘El ruido de las cosas al caer’) won the prestigious Alfaguara literary award in Protected content , and also the Protected content IMPAC Dublin Literary Award. In Bogotá, Antonio Yammara reads an article about a hippo that had escaped from a derelict zoo once owned by legendary Colombian drug kingpin Pablo Escobar. The article transports Antonio back to when the war between Escobar’s Medellín cartel and government forces played out violently in Colombia’s streets and in the skies above. Back then, Antonio witnessed a friend’s murder, an event that haunts him still. As he investigates, he discovers the many ways in which his own life and his friend’s family have been shaped by his country’s recent violent past. His journey leads him all the way back to the Protected content and a world on the brink of change: a time before narco-trafficking trapped a whole generation in a living nightmare. You can find this novel in both English and Spanish. It’s available on Amazon and you can also buy it in any bookstore in Bogotá.